The Chosen Prince, by Diane Stanley (HarperCollins, January 27, 2015, middle grade) -- a nice one for the young romantic. Alexos is a prince of a people who have offended Zeus, and who are cursed with a never ending war against the other kingdom with whom they share an island. But the people have pinned their hopes on Alexos--the auguries read when he was a baby showed he might be the chosen one of Athene, the tool she will use to bring peace and plenty back to the island. Alexos does his best to be a good prince, though he can never please his stern and distant father. But though he may (or may not) be Athene's chosen one, fate is unkind--when he is twelve, he is stricken with a polio-like illness that leaves one leg all but useless and the other weak. Just as he begins to recover his strength, learning to walk again with brace and cane, he hears his father deciding to make his younger brother Teo the heir. And then Alexos finds himself betraying Teo, committing an act for which he can never forgive himself. All the years that follow he tries to do good for his people....but always there is pain, both of the body and of the mind. You may read in other descriptions of the book that there is a girl involved, but she is not exactly "the heroine." Though her role is important, she herself is a minor character who enters the main story toward the end. She is brave/smart/beautiful for her small number of pages and then gets to have (rather sweet) romantic attachments of the insta-love sort to Alexos. 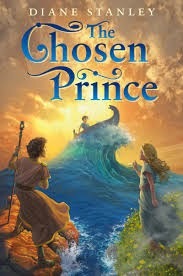 You may also read that The Chosen Prince is a take on the Tempest--and yes, there is the magical island with the above-referenced girl and her father, and yes, a shipwreck brings strange men...but that's about it, so don't be expecting a Tempest retelling as such. So. I read this in one day, and enjoyed the reading, but alas, I kept comparing it to The Thief, by Megan Whalen Turner, which is totally unfair, but there it is, and as a result I am somewhat tepid in my feelings. I can imagine this book being loved, though (especially by people who aren't already fans of The Thief), and so my thoughts aren't entirely positive, I don't want to be utterly off-putting. The Chosen Prince is very much a character driven novel, and the reader has to care about Alexos for it to work. He's a very sympathetic character, certainly, and his situation is interesting---but he didn't quite sink his claws into me, as it were-- I never cared that passionately about him. Possibly this is because he is so very worthy--no snark at all, bravely accepting his disability, determined to be good. Possibly it is because the book is written in the third person present, which gave it a rather cinematic effect; I felt I was watching a movie (in large part because Diane Stanley is a masterful describer) as opposed to being inside his story. (The third person present is not my favorite tense, and I'm not sure it was the best choice for this story). I was also somewhat disappointed by the generic-ness of Stanley's ancient Mediterranean, which seemed more a generic past of standard palaces, mud, and peasants than a truly realized classical era in which the Olympian gods were worshiped. The gods are real, but the reader doesn't get much sense that the characters truly think about them much. In my mind, the perfect reader for the book is any 10-12 year old who might want to crush on a sweet, sensitive boy who is all but broken by fate but is still trying (and succeeding) to be a good person. I would not suggest it as a Percy Jackson read-alike (Greek gods do not a P.J. read-alike make). I would not suggest it to anyone who likes their fantasy brisk and magic-filled; the plot here is a slow-burning fuse. But that young, romantic reader who dreams of strange places and beautiful boys and the magic of the gods making everything all right in the end may well love it lots.